You’re in the dentist’s chair having your checkup when they break the news. You have a cavity, and it needs to be filled. But, you think, you feel no pain. Is a filling really necessary? Is it really that big of problem this soon? Could you get by without having it filled? Well, not addressing a dental cavity early on can have serious consequences down the road. Keep reading to learn about six potential outcomes from not treating a cavity. Although your cavity may be small now, the decay can penetrate deeper into the tooth. Once it has reached the pulp, or the center of the tooth, you can experience a lot of pain. That’s because your tooth’s nerves are housed in the pulp, and they can communicate discomfort to your brain very strongly. Cavities are caused by bacteria, and bacteria can continue to grow and spread and even transfer from tooth to tooth. If you don’t resolve your cavity quickly, you could find decay on multiple teeth instead of just one. The longer you wait to have your cavity filled, the more damage the cavity can cause in your tooth. While it requires only a small filling procedure now, it could take a root canal or more intensive treatment to fix later. This treatment can be not just more complicated but also more expensive. You can save yourself a lot of time and money by fixing your cavity sooner rather than later. 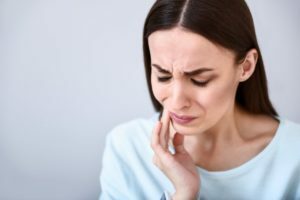 There is a chance that you won’t feel pain even as the infection spreads to the pulp of your tooth, but you may feel a sharp jolt of pain as it affects other areas of your mouth. As a result, the entire side of your face can become swollen because of the infection. This is particularly worrisome if an oral infection happens in your child, and it could require a trip to the emergency room. Although used as a last resort, extraction is a possibility. If the decay has overcome the tooth, there won’t be enough tooth structure to support a filling or dental crown. Postponing treatment could mean that your entire tooth may be need to come out. When your suffer an oral infection, there is a risk, especially for young children, that it could spread to your brain. Also, in the past, untreated oral infections have led to death in some cases. If you or your child has facial swelling, you should visit the emergency room immediately. But the easiest way to avoid this potentially life-threatening situation is to treat the cavity as soon as your dentist finds it. In the end, it is worth the time, effort, and money to fix a small cavity now than to put it off until later. By then you could experience one or more of these unpleasant results. So, even if it doesn’t currently cause you any pain, get your cavities addressed so that you can have better oral and overall well-being in the long run. Make an appointment with your dentist to have your cavity filled today! Since 1977, Dr. James Geer has served patients in the Tomball area. He and his staff take a preventive approach to dentistry, but they also do their best to help patients who need help with dental emergencies. For their regular patients, they provide 24-hour access to a member of their staff in case of a dental emergency and can often accommodate these appointments on the same day. To schedule an appointment, call (281) 357-4337 or click here.